Happy Sabbath! I hope your weekend is starting out to a great start! I am super excited to share this fun sign I made for the Rinea DT. It is perfect for hanging on your door or in your home. I created my sign with a Patriotic Color Palette. I used some plain black cardstock along with some amazing Rinea Foil Papers in Red, Blue, and Silver. These colors are all part of the Patriotic Seasonal Pack. Here is a closer view of the Flip Flops. I started with a plain black cardstock and then used some Sapphire (Blue) Foil paper. I created the pattern and cut it out with my electronic die cutter machine. I then used some red stardust foil paper to cut out the patterns for the flower. Here's a closer look at the sign. For this, I cut the base with some black cardstock. I also cut out the words with my cutter with some plain black cardstock. I then layered the sign with some white cardstock and then some Silver Starstruck foil paper. 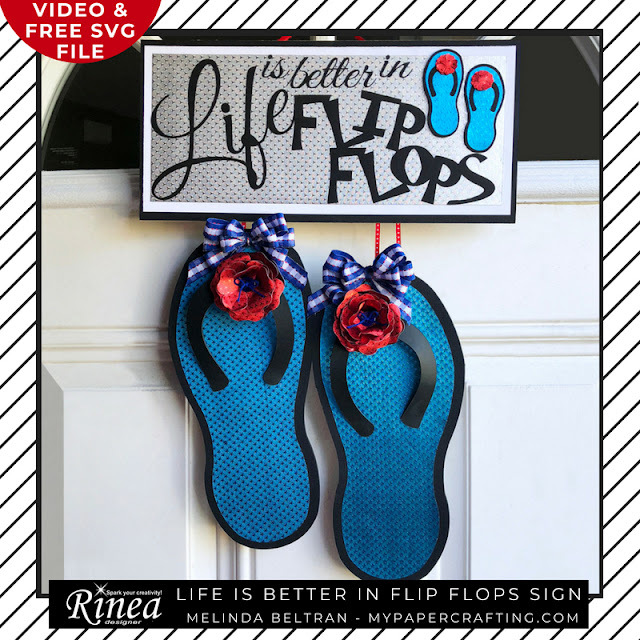 I created a couple of very small versions of the flip-flops for some decoration for the sign. Here's a closer look at the flowers for the tops of my flip-flops. I added a blue button and a little twine bow to their centers. I used some ribbon to make some bows for a little extra decoration and added them to the tops of the flip-flops. Here is one last look at the completed sign. It will give any wall or door a fun and happy look for the summer! For those interested, I am sharing the cut file I created for this project so you can make your own!!! It will be free for a limited time. Head over to my YT Channel and pick up the blog post link there! Be sure to head over RINEA Shop and grab some of this amazing, craft essential! As always, thank you so much for stopping by. Until the next time, have a wonderfully crafty day! Enjoyed your video and your flip-flops and sign are adorable. Loved hearing your voice again, dear friend! I’ve missed crafting with you! This is really a fun sign, I'm think a gift for a friend. Thank you for sharing.